Park Pobedy, or Victory Park, a spacious square hosting the Museum of Great Patriotic War, is a popular meeting place for veterans in Moscow on May 9. Veterans can be seen here with armfuls of flowers that they receive from Muscovites honoring their sacrifices during the Great Patriotic War. Sofya Gudinova, a spry lady wearing sunglasses, was 14 when the war began. At 15, she already headed a team of workers at an ammunition plant near Moscow. “Victory Day is the most cherished holiday for our people. I personally feel both happy and sad on this day,” said Gudinova, adding that she lost her “first love” two weeks before the war ended. Victor Nikolayevich, another veteran living alone in Moscow, comes to Victory Park on May 9 every year to see his friends. Today he met with two. “Fewer turn up from year to year,” he said with a sigh. He was recruited into the Baltic Fleet as a cabin boy at the age of nine, and also served in an artillery battalion. “I don’t want to recall that,” he said when asked about his wartime memories. 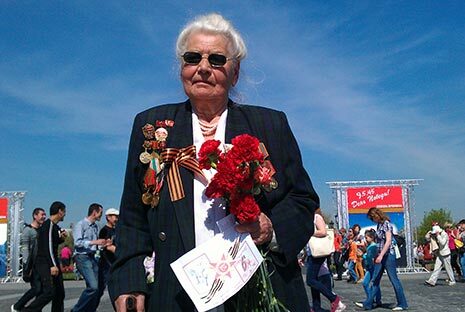 Alexandra Remizova, 92, was taken to Victory Park by her grandson. “I can hardly walk anymore,” she said. She was one of the defenders of her home town of Smolensk, one of the hardest-hit regions in the struggle known in Russia as the Great Patriotic War. When the town surrendered, she had to relocate to Moscow. “Not all of the young people understand what it took to win the victory,” she said. Yevgeny Ivanovich, an 88-year-old former member of a tank crew, came to Victory Park with his daughter. “I learned that we won when I was 19 kilometers east of Berlin,” he said. “They’d better have saved the fuel and given the money they spent on that to orphanages,” he added. Veterans Sofya Gudinova and Alexandra Remizova argued the parade is absolutely necessary, even though Alexandra Remizova admitted she didn’t watch it this morning. Denis Semyonov, 24, one of the dozens of Muscovites who took to Victory Park to present flowers to veterans, said the military parade is an important event in May 9 celebrations. “It reminds of the feat of the soldiers that fought in the Great Patriotic War and shows our military and spiritual might,” he said. Oleg Terekhov, a ninth-grade student and an activist with the “Territory of Intellect” youth movement, was handing out letters to veterans.